Muslim and minority groups across the Lower Mainland are bracing for backlash in the wake of this week’s terrorist killings in Ottawa and St-Jean-sur-Richelieu near Montreal. “I’m more pissed off than anybody,” said Farid Rohani, who immigrated from Iran in 1970. “Of course I expect backlash, who doesn’t? 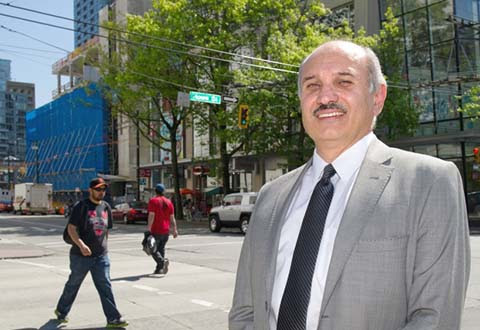 Doing that part, said Rohani — who is executive director of the Vancouver-based Laurier Institution — means speaking up, something he urged all immigrant leaders to do. Even if sounds like an empty ritual I do think it helps for Muslims to publicly dissociate from these kooks. 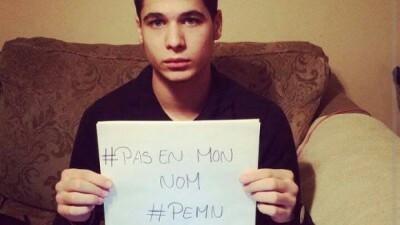 A young Montreal Muslim teen-agers has got a great reaction from posting “Not in my name” on his Facebook page: One Quebec Muslim teenager’s message has gone viral after he posted a photo of himself holding a sign that reads “pas en mon nom” — “not in my name” — in response to this week’s killing of two soldiers in separate attacks in Ottawa and St-Jean-sur-Richelieu. The week’s events prompted Ali Chebli, 17, a Muslim of Lebanese descent, to take to social media. “I’m a Muslim and I’m against ISIS. My mission is to fight against hate speech and the actions of jihadists,” the business student at Collège Maisonneuve wrote underneath the photo. The message has been seen almost 800,000 times since it was posted on Wednesday. Now Chebli is hoping to hit one million views. While I appreciate this young man’s efforts and I am sure he is sincere, there is the European example: a similar initiative foundered and turned into snarky #MuslimApologies which were anything but. Again, one fears that the difference is between here and Europe is simply the lower fraction of the population that is Muslim. So we only have to sit and wait until the situation deteriorates as it has in Europe. Once they reach a certain fraction, they start to get very cocky and arrogant. Further Muslim immigration is not desirable. Let us stop the experiment where it is. Reading #MuslimApologies reinforced every single stereotype and put me off Islam even more than before. ‘Apology’ is not the right word anyway. One should not be expected to apologize for something one has not done—in my opinion anyway. Plenty of people expect the current Europeans and their descendants abroad to hand out apologies for things they did not do. ‘Not in my name’ captures it nicely. The 2019 Easter Egg Roll is almost here! Absolutely devastating to see the news out of Sri Lanka this morning. These were Christians targeted simply for practicing their faith on Easter. Please pray for the community there, especially the victims, that Christ would provide His peace to those who are hurting. Think about this: we had a President under a constant 2 year investigation for a fabricated collusion conspiracy, and yet America is still seeing a record economy, +3% growth, a soaring job market, and the lowest unemployment in half a century. @realDonaldTrump delivering anyway.